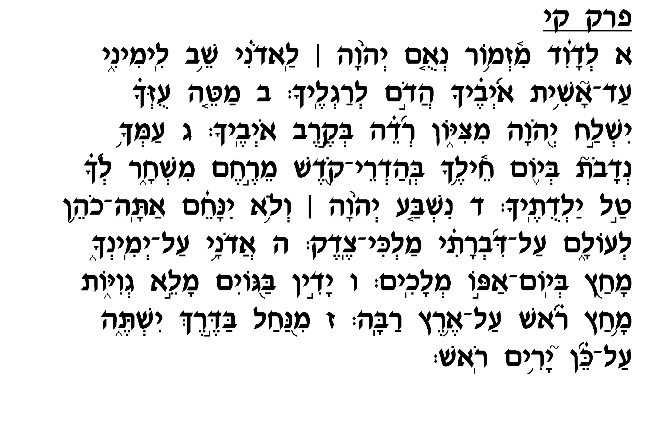 Several commentators, including Rashi, interpret this chapter in accordance with a Rabbinic tradition that it refers to the battle waged by Avraham Avinu against the four eastern powers, as told in the Book of Bereshit (chapter 14). The forces of these four kingdoms came under attack by Sedom and its four allies, and this battle resulted in the fall of Sedom and the capture of all its possessions and people. Lot, Avraham's nephew, was among the captives, and upon hearing of these events Avraham immediately mobilized a small force of 318 men to rescue <?xml:namespace prefix = st1 ns = "urn:schemas-microsoft-com:office:smarttags" />Lot. Avraham and his men pursued the four kings and miraculously defeated the enemy nations and retrieved all the captives and their property. The first verses of this Psalm recall God's promise to Avraham that he would successfully defeat the enemy kings and achieve prowess over them as though they were his "footstool." Verse 3 (according to Rashi's interpretation) points to Avraham's great merit in recognizing his Creator already at a young age, in reward for which he earned such overt divine intervention. 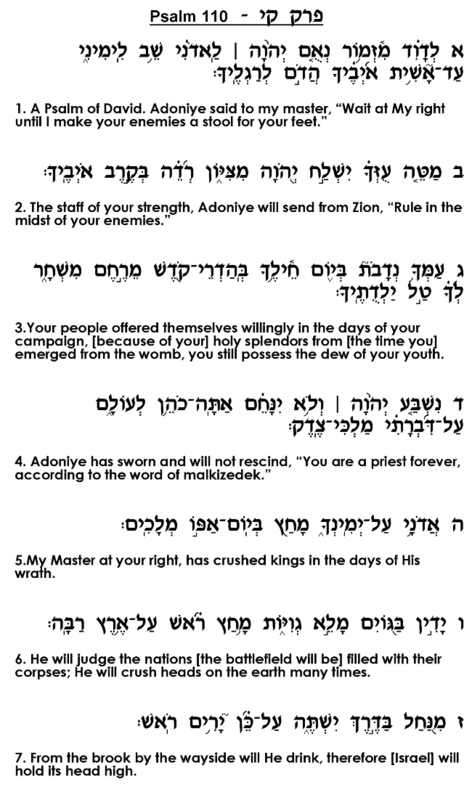 In this chapter's final two verses, the Psalmist turns his attention to the "Berit Ben Ha'betarim" covenant that God established with Avraham immediately after this war (Bereshit, chapter 15), in which He promised to visit harsh punishment upon the nation that will enslave his offspring. This chapter speaks of Egypt's arrogance in feeling entitled to enslave Bene Yisrael, for which it was severely punished, as we know from the story of the Exodus. 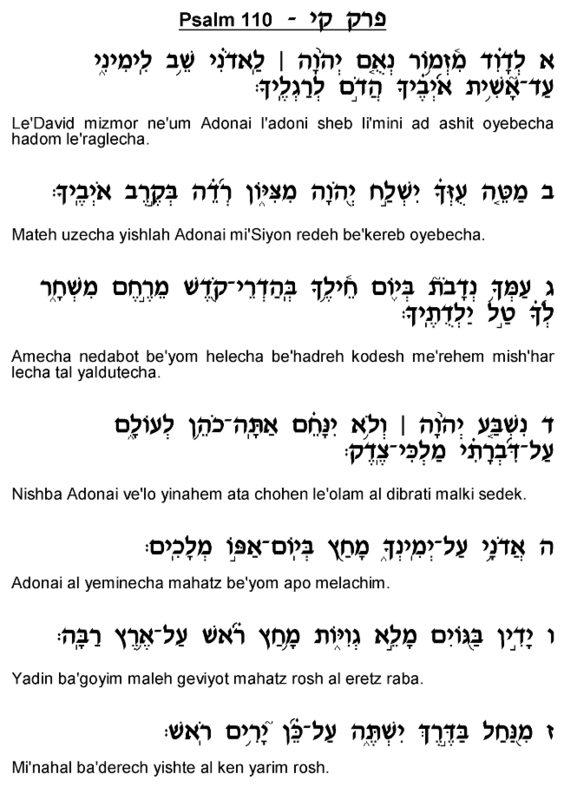 The Radak, however, explains this Psalm as a hymn composed by a poet in honor of David's victories over his enemies. Upon ascending to the kingship David led Bene Yisrael in many victorious battles against several enemy nations, thereby securing the country's borders and establishing Israel as the most powerful nation in the region. The composer of this Psalm celebrates David's victories and sees them as the fulfillment of God's promise to deliver Israel's enemies into his hands.